I need to share with you, dear readers, the events that unfolded last Saturday. It was a dark and stormy night, the type of night that makes you wish you lived on the equator during their 6 months of constant daylight. There was an uneasiness over the Beerman household. No one dared to make a sound. You could faintly hear the tick-tock of the digital clock. Tick, tock, tick, tock. Both man and beast were scared to announce they were hungry, for we all knew what would happen. Finally Beerman’s stomach gave him away with a big stomach-gurgling shout… he was starving! Then a voice rang out, “since you are so hungry, guess you’re the one making dinner”. The horror, what is Beerman to do? Doctor Strange saw 1 million different possibilities, but only one made sense. He handed Beerman the phone and dialed 860-379-0775. On the other end of the phone a soft voice rang out, “Hello – Kent Pizza, how may we help you?“ The family has been saved. Beerman will cook dinner with the only ingredient he knows… VISA. Kent Pizza is located at 536 Main Street, Winsted, CT. A couple of words come to mind when I reflect on my experience: value and quality. Seems at some restaurants you need to take out a home equity loan to take the family out. Not at Kent Pizza! For under $40 we got a large 3-topping pizza, a large salad, chicken wings, and two cans of soda. And, as an added bonus, Kent Pizza cuts their slices in squares instead of pie wedges. This gives you more pieces for your dollar. Reasonably priced food is only one side of the equation; good taste is a must. I believe Einstein had a formula for this, V = R + T or Value = Reasonably Priced Food + Taste. Speaking of taste, Kent Pizza’s chicken wings were terrific! They had the perfect balance of spice, heat, and flavor. And the best part was, they were not covered in a sauce that traditionally covers my shirt. The greatest feature of Kent Pizza is the fact that it’s a mere 0.3 mile walk to the Little Red Barn Brewery. 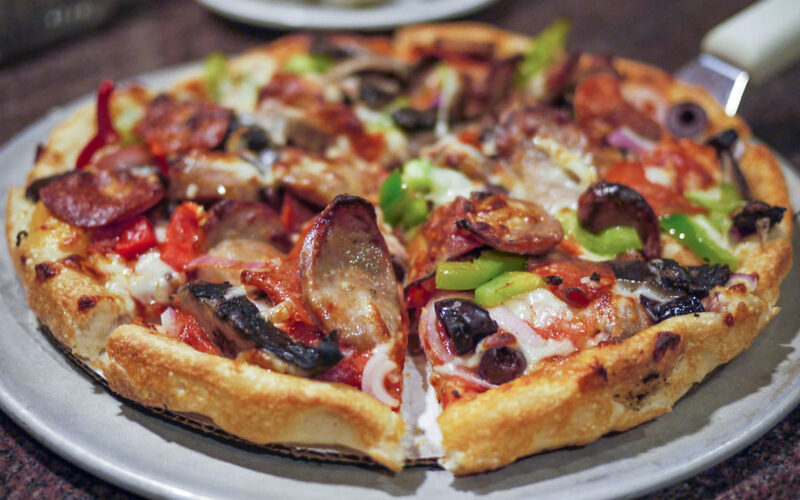 In less than a 10-minute round trip, you can bring great pizza and craft beer together. This is a modern day Romeo and Juliet, except for the horrible death scene at the end of the play. The outcome of Kent Pizza and LRB beer, I promise you dear reader, will have a happy ending. Stay tuned for future Spotlights on Winsted!